Thera - The eruption of Thera (modern Santorini) is probably the first major volcanic eruption in recorded history, as well as the second most violent in human history (after the 1815 eruption of Tambora). More importantly, it significantly altered the course of civilization. 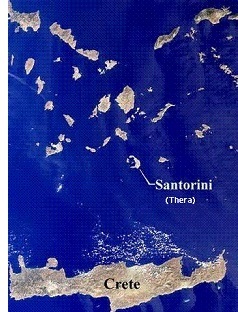 Thera is an island in the Aegean Sea, located about half-way between Greece and Asia Minor. Early Minoans, not knowing it was a volcano, discovered that its sunken caldera made an ideal natural harbor, and founded the city of Akrotiri. Minoan civilization was on the ascendancy. But sometime in the middle of the second millennium, the island exploded. It virtually wiped out Minoan civilization. At the time, Mycenaean civilization, on the Greek mainland was in its infancy. We will never know how the interaction between the two would have played out had natural development continued, but from that point, Minoan civilization ended and Mycenaean civilization became dominant. As interesting side stories, the Thera explosion is likely the source of the tale of Atlantis. Much less known, but surely more controversial, some historians believe the eruption coincided with the Hebrew Exodus from Egypt; and the tsunami that resulted from the explosion is what wiped out the Egyptian army that was pursuing the Israelites (note how Moses and Thera line up on this chart. This may or may not be accurate). There is no evidence for this theory, nor will there likely ever be, but it is interesting nonetheless.